This pose is a great start to any yoga sequence due to the fluidity that it creates in the spine. The wavelike motions help relinquish any tension that may be held in the neck or shoulders. In this pose be mindful of your alignment and stack your shoulders over your elbows and wrists. On your exhale, hug your belly toward your spine. Then, on your inhale, soften your belly toward the floor, relax your shoulders down and lengthen through your crown. This minor inversion sets you up for direct relief. It allows your head to hang and your shoulders to relax. In this pose, stress melts away by having all four of your limbs on the mat, allowing you a chance to fully ground yourself. You can close your eyes, take deep breaths and release what is no longer serving you here. Make sure you spread your fingers and toes in this pose. Tuck your chin toward your chest to lengthen the back of your neck, which relaxes the muscles of the neck or shoulders. Raise your hips toward the sky and send your breath down through your hands. Like Down dog this position gives your neck and shoulders tension-free rest. This position also gives your body some options. You can keep your palms on the mat in a traditional position or you could clasp you fingers behind your back creating a deeper stretch for the shoulders. Another choice, is to hold onto an opposite shin, one at a time, deepening the forward fold or you can bring your back against a wall. Play with what feels best in your body, and what relieves your head pain. In this pose, root deeply through your feet. On your inhale, lift through your chest while engaging your thigh muscles. On your exhale, keep the length in your torso as you lean down toward the floor. Then plant your palms on the floor (or take any of the previously mentioned arm variations) and stay here for as long as feels comfortable. Make sure to roll your shoulders away from your ears, releasing pressure. This pose helps many ailments by increasing blood flow. It allows a relaxing stretch to the neck and spine and opens up the heart, all while alleviating stress and restoring a sense of calm. To practice this pose lay on your back, bend your knees and bring your feet to the mat about hip-distance apart. On your inhale, press equally into your shoulders and feet to raise your hips to the sky. This should lift your sternum toward your chin. You can stay here or to take it further by interlocking your fingers on the ground under your body, and rolling your shoulders under and toward each other. This elicits a deeper stretch. From here bring your focus to elongating the body, relaxing the mind and breathing deeply. This is a forward fold variation appropriate for yogis of all levels. This position increases circulation and releases lingering stiffness. The stretch forward increases structural alignment and lets go of any strain. To start, sit with one leg straight and the other bent with the heel of your bent leg drawing into the opposite leg's inner thigh. On your inhale, press through your sitting bones and lengthen your spine toward the ceiling. On your exhale, bend forward leading your chest over and toward the straight leg. Hold for a few deep breaths before switching sides. Legs up the Wall is a great restorative pose. The focus here is on restoration! Rest and relaxation is important to help alleviate any pesky headaches. 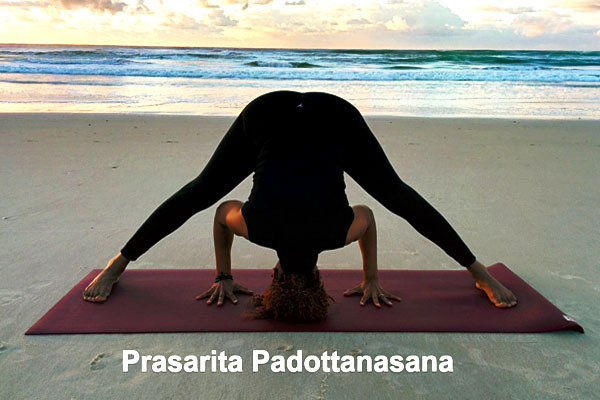 This position also encourages a sense of peace and calm. In this pose, get your bottom as close to a wall as you can. If this is uncomfortable use a pillow or blanket to lift your bottom up. You can even use a strap or scarf to tie your legs together as they reach up the wall toward the ceiling. Close your eyes, bring your attention to your breath and surrender. All of these poses are suitable for yogis of all levels. They are relatively simple to get into, and stay in, as you feel your headache melt away. No matter the reason for your head pain: tension, stress or even sickness, yoga is a catchall healer. So whenever you feel the pains start, quickly fold into one of these positions and be pleasantly surprised as your pain subsides!